Text: On the 29th, the pinnaces were ordered out, and we proceeded to Oparree, in the same state as on our first visit. At the landing-place we were received with uncommon marks of friendship. Every chief in that part of the island, of which Ottoo was the Earee-da-hai or Lord paramount, to the number of 500 and more, attended, and conducted us to the king’s house or palace, where a sumptuous banquet was provided, and after dinner a more numerous and brilliant company of performers assembled, at the theatre for our entertainment, than we had ever seen on any stage in the tropical islands before. There is a sameness in their drama, that admits of little or, no variation, as perhaps to foreigners, who are unacquainted with the language and manners of a country, there may appear to be in every stage-exhibition, wherever performed. Be that as it may. 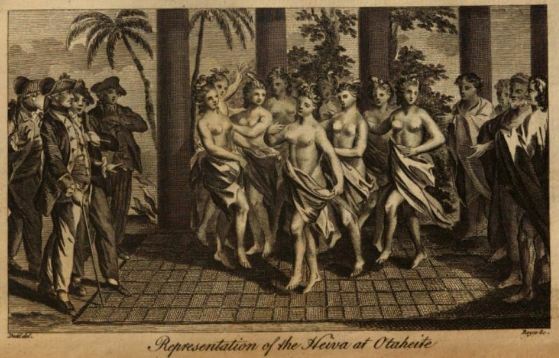 The dresses on this occasion were entirely new, and by far more showy than formerly; the number of dancers were increased; ten young ladies composed the first group, with their heads most magnificently ornamented with beads, red feathers, shells of the most beautiful colours, and wreathed with flowers in so elegant a style, as hardly to be excelled; had their music been equal to their performance, this part of the exhibition would have been compleat. A party of warriors were next introduced, dressed in their war-habits, consisting, as has already been observed, of different coloured cloth, of their own manufacture, so ingeniously fashioned and blended together with so much art, as, with the helmets that cover their heads, to fill the stage with men, of whose majestic figure it is not easy to convey an idea. These were armed with spears, lances, and battle-axes, and exhibited all the forms of attack and defence which are practiced in real action. The principal performers were the king’s brother and a chief of gigantic stature, who displayed such wonderful grimaces and distortions of face and countenance, by way of provocation and challenge, as were not only laughable in some attitudes, but terrible in others. After these disappeared, the players were brought forward, and performed a more serious piece than we had yet seen, at which the natives sat graver and more composed than usual. And the whole performance concluded with a dance of ten boys, drest in every respect like the girls in the first scene, with their hair flowing in ringlets down their shoulders, and their heads ornamented in a very theatrical style. When the play was over we returned to our boats, attended by the whole assembly, who accompanied us to the water-side, where the king took a most affectionate leave. Comments: John Rickman (1737-1818) was Second Lieutenant on the explorer Captain James Cook’s third and final voyage, 1776-1780, to New Zealand, the Hawaiian islands and the Bering Strait, in covert search of a North West Passage. Cook was killed on their return to the Hawaiian islands. Rickman kept a log of the journey which was published anonymously in 1781. This passage comes from the visit paid by Cook’s two ships, Resolution and Discovery, to Tahiti in August 1777 (the official purpose of the voyage was to return the Pacific islander Omai, who had been to England, to his home). Cook had first visited Tahiti in 1769, and again in 1773-74. Oparree [Pare] was on the island of Otaheite.